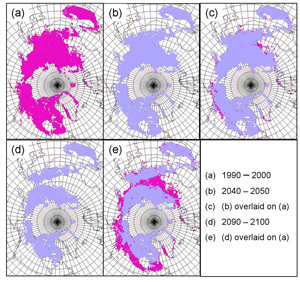 The mean extent of permafrost estimated for the time periods (a) 1990–2000, (b) 2040–2050, and (d) 2090–2100 based on simulations of Euskirchen et al. (2006). The pink area in panels (c) and (e) indicates the loss of permafrost between panels (a) and (b) and between panels (a) and (d), respectively (source: McGuire et al. 2009). Important insights about the impact of carbon release from permafrost thaw on future climate have been derived from uncoupled dynamic ecosystem model and coupled carbon-climate model simulations, but there is still a great deal of uncertainty on the future rate of permafrost degradation in response to climate warming. Moreover, our understanding of the responses of the coupled hydrological and carbon cycles to permafrost degradation across spatial and temporal scales is very limited, as is our predictive capability regarding the resulting changes to biogeochemical cycles. 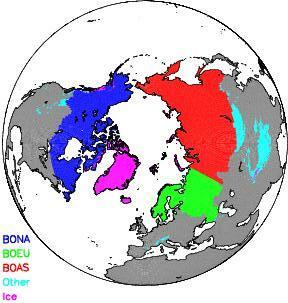 Earth System Model (ESM) simulations have suggested that substantial permafrost thaw could happen during the 21st Century, but these results have been controversial due to structural limitations in the class of land models used in ESMs and due to biases in simulated soil temperatures associated with ESM climate biases. The production of a synthesis paper on conceptual approaches that should be embraced by coupled permafrost-carbon models. This project evaluates model projections of vulnerability of the permafrost region by comparing 15 land surface model simulations including carbon cycle processes and permafrost for two time periods. 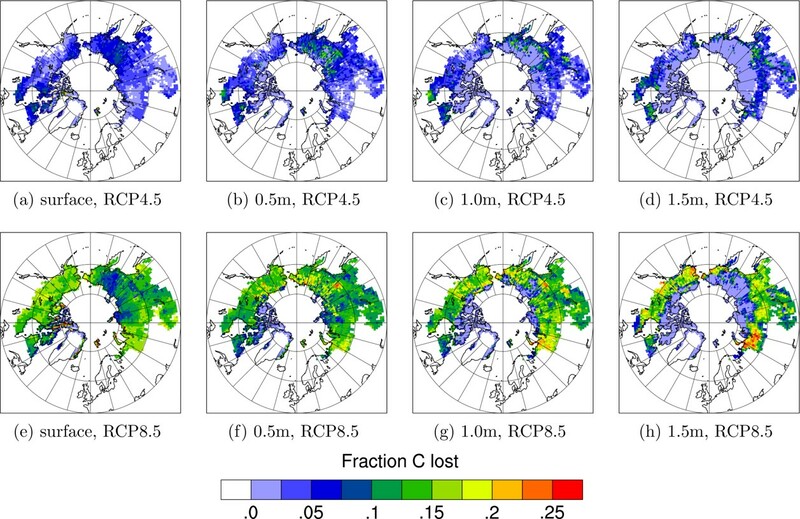 Results from this model intercomparison help evaluate how differences in model structure and parameterization influence projected uptake and release of carbon for the permafrost region in the current and future climate.